40+ fashion, Dorothee Schumacher, fall fashion, fashion over 50, Net-a-porter.com, Nordstrom Anniversary sale, The Edit. For a week or so I’ve been singing (in my head) a country song from the 1980’s… from that truly awful movie, Urban Cowboy, staring John Travolta and Debra Winger. That’s because I am looking for love. Trying to find inspiration for fall shopping. Trying to psych myself up for the Nordstrom Anniversary sale that starts soon. My buddy Liz who is the personal shopper at the Rideau Center Nordstrom told me about this “event” last month. Since I was a faithful shopper at the Holts yearly pre-fall event in August… she knew I would be interested. Yup… I am. New fall looks going on sale for one week in July and then disappearing again until the actual fall season starts… I’m interested. Or I should be. I will be. Once I am able to summon up any enthusiasm for fall. Summer has only just started around here. I haven’t had time to wear my summer clothes yet. I dreamed up all kinds of summer outfits to incorporate my pre-Paris purchases, and my post-Paris purchases, not to mention favourite items from years gone by. And I’ve hardly worn any of them. I’m not ready to be thinking about fall…. not feeling the love for fall… at all, at all. And that’s why I’m looking for inspiration. Looking in magazines and on-line trying to get a feel for Fall 2015. Hoping to be struck by love at first sight. You know, that feeling where your heart skips a beat, you get all fluttery inside… and you just know that you and that tweed blazer, or those camel pants and that soft, creamy silk blouse were meant to be together. 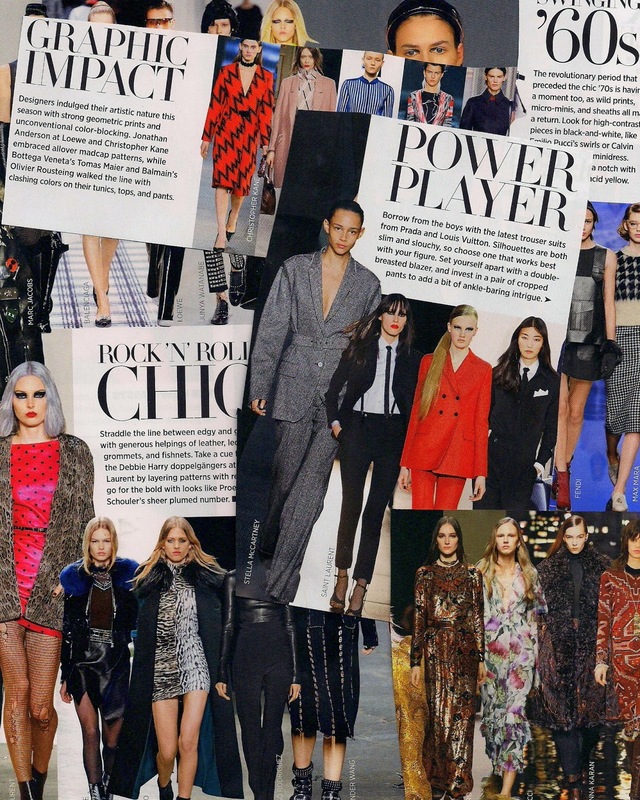 I checked out the Fall 2015 Runway Report in the June/July issue of Harper’s Bazaar. Graphic prints, menswear inspired suits, “swinging ’60s” mini skirts, bohemian maxi dresses. Meh. I didn’t hate anything. Well, except for the “Rock ‘n Roll Chic” stuff. How about that Courtney Love inspired Saint Laurent look on the lower left, with the ripped fishnet stockings, eh? …Uh… I don’t think so! But for the rest. It was same old, same old. Nothing new, nothing that we haven’t seen creeping in these last few seasons. Bu-ut, when I think about it, that can be good, you know. It means that Fall 2015 can be all about updating items that I already own. Or replacing others that I’ve worn to death. Like boots; I really need a new pair of boots. And maybe adding some of those looks that I didn’t embrace last season. But which have grown on me. Like a pant with a fuller leg? Hmmm. Maybe. And while the Bazaar fall “forecast” didn’t make me fall in love, I wasn’t entirely unsuccessful in my search for looks that did. I love this silk blouse and tweed blazer from Ralph Lauren that I saw in the July issue of Vogue. The high collar with those lovely chandelier earrings… very Downton Abbey, wouldn’t you say? I won’t be investing in a new tweed jacket; I already own a couple that still make my heart go pitty-pat. But a soft, silky blouse would be a good investment. Great with the tweed jacket and jeans and boots. 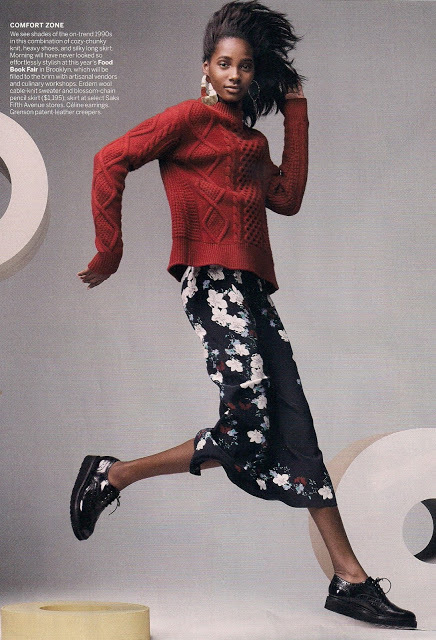 And while this look from the April Vogue was meant to be for spring, it would also be great for fall. I really like the idea of mixing textures, the heavy cable-knit sweater with the frothy skirt. And those thick-soled oxfords give the outfit some weight… making it cool instead of blah. Not sure I’d get much wear out of a skirt. But I like this one. I subscribe to the weekly on-line magazine The Edit from Net-a-porter.com. I love the things the editors at Net-a-porter do with clothes. Gives me all kinds of ideas. Like this look on Laura Linney from the latest issue. That Burberry coat, that Frame Demin blouse, those Etro pants…. so minimalist and mono-chromatic, except for those killer Gianvito Rossi burgundy pumps, and a pop of red lipstick. So lovely. In fact, it was love at first sight. You can read the article on Laura Linney in The Edit here. And later in the same issue I saw this look on actress Naomi Harris. So very chic. Perfect for fall. Her animal print pants are by Altuzarra, and the camel sweater is by Chloe. Black and camel and gold. Sigh. You can read the whole article on Naomi Harris in The Edit, and check out her other fall looks here. It’s nice to see that animal print is still around this season. I have an animal print cardigan that I still love and haven’t worn as much as I should. But while I love this outfit, I could never pull off a slim fitting sweater like that, with those cotton, stretch Altuzarra pants. Not anymore. But I could definitely go for that sweater with a different pant. Maybe high-waisted and a bit fuller in the leg? Or a sweater that was a bit looser, and maybe a teensy bit longer. In my quest for fall fashion love, I checked out a Danish blog called Look de Pernille and found this post about German designer Dorothee Schumacher. I had never heard of her…and I probably wouldn’t be able to get her clothes in Canada, anyway. But I like her designs. Her clothes are very chic, with clean lines and no fuss. These are three looks from her Fall 2015 collection. You can check out the entire Dorothee Schumacher Fall 2015 line here. I love all of these looks. Those burgundy suede pants are scrumptious. Love the orange on orange sweater and skirt. That grey coat is very Max Mara, in my opinion. Very slouchy, retirement chic. And while I might not be able to find Dorothee Schumacher here, I will definitely find Max Mara. And Vince, and Theory, and all the other lines that I love. I know I will. But sadly, despite all my searching, I still haven’t been able to summon up any enthusiasm for shopping for fall. Not yet. Not when it’s 30 degrees outside. And I get hot just thinking about pulling on a turtleneck… in the middle of July. And I can’t think of anything I really must have. Or desperately need. So it seems I will hit the sale next week with no real burning desires. No sense of my ‘must-haves’ for fall. No preconceived idea of what I want, or need. Well, except for boots. I’ll look for low heeled booties, not black. Yep, I’ll be flying without a net, or, in this case shopping without a list. Which, in my opinion, is just as dangerous, people. And something I pretty much never do. “Listless” shopping will be an entirely new experience for me. I guess I’ll just cruise the store, “lookin’ for love.” No plan, just check out the merchandise and see what strikes my fancy. See if there’s a special sweater that makes my heart skip a beat, or a creamy silk blouse that was just meant to be mine. And you know what… I’m kind of looking forward to it, now. Are you able to psych yourself up for fall shopping at the beginning of summer? Or do you pretty much not bother until fall rolls around? No way will I be shopping for fall yet! Not only do I have a full enough wardrobe that I should do any of my shopping in, not only am I facing a completely different lifestyle and schedule for my first Retired Fall, but it's simply too hot and dry here to allow me to take Fall textures and colours seriously. Perhaps it's short-sighted of me, but I'm going to enjoy the summer moments first, fleeting as they are. . .
and I beg to differ about Urban Cowboy! Yes, romantic melodrama, no question, but Winger has never turned in a performance I'm not happy to watch and I'm a Travolta fan from, like, forever 😉 (Uh, Vinnie Barbarino anyone?) Plus I think the movie, if I remember it at all, said a few perceptive things about contemporary society of its day. . .
Ah…Urban Cowboy…I worked in Houston right after its release and we loved to go to Gilley's on the weekends…so much fun. I love dreaming of fall and planning and of course, saving money on sales. It is my favorite time of year and just doing a Fall 2015 Pinterest board brought me joy. Thanks for introducing us to new lines here! I'll bet that was a good time, Pam. Must get back to Pinterest…maybe that will help me get motivated. Like you, I love the ritual of preparing for fall, leafing through the magazines, unpacking my winter clothes and deciding what to buy new. This fall shopping in July really throws a monkey wrench into that. Like Christmas shopping in August as some people do….blah….I hate that! First time shopping for fall without a list of what I want. I will be taking my "little book" with me wherein is a list of what I already own…just in case of memory lapse. I'll let you know if I'm successful. I loved that pic of Laura Linney. And fall fashion is always what inspires and frustrates me most. Inspires for the styles and colors, and frustrates because it won't be cool enough here to wear most "fall" clothes until December! I look for styles in lightweight fabrics with a "fallish" feel that I can start incorporating in September. She's lovely, isn't she? We'll be putting on our fall stuff here sometime in October….but then again we won't be taking it off until late April! Still I do look forward to the burgundies and browns and dark greens of fall. Much better colours for me. I love fall clothes best, but I have to purposely try NOT to get excited about fall because we won't have a cool day here until Halloween! Love your inspiration picks! Thanks for supporting Fun Fashion Friday! Thanks for hosting as always Dawn Lucy. And for the e-mail when the link-up begins. I really appreciate that; sometimes link-ups are a bit frustrating when we don't know when they will be "live." I'm totally psyched for fall! I actually have butterflys in my stomach after reading this post! Bring on the tweed! Bring on the suede! Bring on the COATS! I didn't think I was psyched..until I went to the Nordstrom Anniversary sale….all the burgundy and grey and sage green… and the coat sweaters. Now I'm tired of my summer clothes and I've hardly worn them!